I am new to the site and thought you would like to see some of my fish. This is one of my baby bristle nose that I have bred. One of my male Keyhole cichlids. This is Casper. The black ghost knife fish. He is almost 14" long and 4" deep. Pair of Red fin cigar sharks. These are my kribs and there fry. I am on to my 3rd batch of eggs in 6 weeks. That is just a small selection of the fish I have. Now you know why I call myself " the fish shed "
Yay! Another Khuli loach Fan! My - that ones a beauty - nice markings. Oh My Goodness! 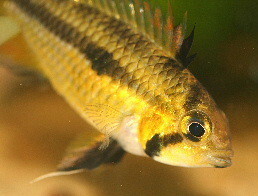 *drool* Denison barbs....... If I could afford the second mortgage I would have hundreds of them....... ?22 a pair round here! Great fish, glad you could stop by to show them off! Wow amazing fish. How many tanks do you have? I have 6 Denisons and they cost me ?15.00 each @ 4" in length. Thankyou glad you like them. wow you got some awesome fish! Those discus look great! I am lucky that I live in Wales and in a soft water area. The Ph of my tap water never goes above 6.1 and I have a lot of jelous people because I don't have to use RO water . nice fish! enter a pic in the next month's POTM! Ah - that'll make them - what - two years old ish? My lot are either about 11month old, the other half are about 8months. I love them to bits, and know them all by name! Dark says the "sparkly fish have indicators on their tail - how useful!" I am in south Wales in the Rhondda Valleys Mike e. t.
One of my 4 sterbi corys. This is Dyson my giraffe nose catfish. Some of my Panda cories.